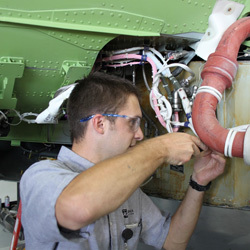 Alec Schau, Intern from the Aviation Maintenance Technology Program at Western Michigan University College of Aviation, working on a Global in Battle Creek, Michigan. Each year, Duncan Aviation opens its doors to a class of summer interns to allow students to learn more about the company and possible career paths they’re interested in pursuing. The program also provides Duncan Aviation with an opportunity to meet potential future team members. "The intern program has been very effective at streamlining our recruiting program. We've developed relationships with a variety of schools in the community and have been able to identify certain programs that generate graduates with the same skills and values we're looking for in a new team member,” says Paul David, Human Resources manager. In 2013, interns spanned a variety of departments, including Human Resources, Information Technology, Research/Development, Marketing Communications, Engine and Airframe. The majority of Duncan Aviation’s interns said they hope to continue down the same education path in hopes of earning a full-time position after their internship. Kurt Daniels, an Airframe intern, is currently majoring in Aviation Maintenance at Western Nebraska Community College and says he enjoyed the wide variety of aircraft on which he was able to complete smaller tasks while shadowing quality Duncan Aviation team member workmanship on major jobs. He says he worked on gear swings, gear lube, panel installation and sealant application. “I felt like I had so much to learn and that I was much too slow to keep up with the other guys. I guess that’s just part of the experience. You have to start somewhere,” says Daniels. Duncan Aviation is always interested in skilled talent, attending career fairs and recruiting events throughout the year. Openings for summer interns are posted on the Duncan Aviation Careers website, usually in February or March.